Want to escape to a tropical paradise with your favorite people? Invite your friends to a tiki party. Inspired by two original venues—Don the Beachcomber and Trader Vics—tiki bars and their signature high-octane, fruity cocktails have made a comeback. Hallmark Designer and tikiphile John Dunne gives us a few hints for turning a suburban patio or downtown kitchen into an island getaway. The most familiar tiki is a wooden carving of a Polynesian god. Tiki bars may take their cues from South Pacific cultures, but are idealized, exaggerated American interpretations. “Tiki culture” is a mash-up of island-inspired décor, flavors, and attitude. The centerpiece of your island-inspired party is the tiki bar. To create the focal point of your retro lounge, look no further than your local home and garden store. —Wrap a length of bamboo garden fence around the front of a kitchen island or console table. —Hang grass skirts or raffia table skirts overhead for a thatched-roof look. —Look for Hawaiian party or luau decorations on Pinterest to find more inspiration, from paper lanterns to DIY tikis. —And, because you’re in the tropics, surround yourself with real or artificial plants. The more, the better. To make any tropical cocktail even more impressive, set it on fire. It’s as simple as putting a crouton or piece of white bread in half of a hollowed out lime, spritzing it with lemon extract, and lighting it up (carefully, and away from the thatched roof of your tiki bar, please). 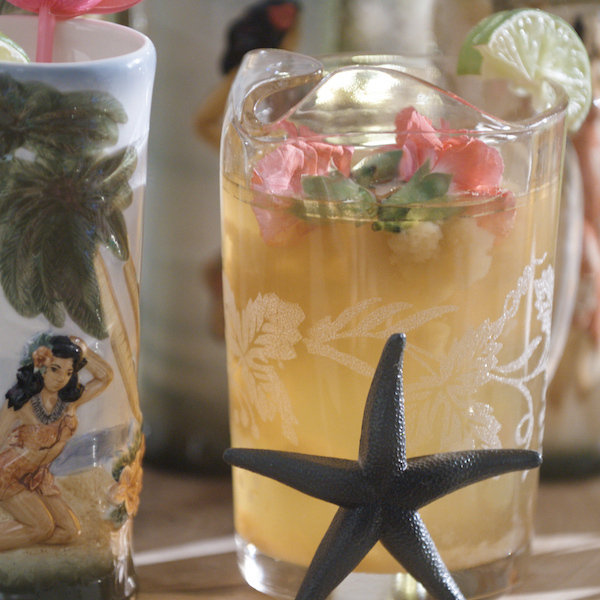 To play up the the theme, you can use luau party or tiki themed barware. Tropical, Hawaiian, or tiki-themed drink stirrers are a quick Amazon-search away. Bamboo straws and paper umbrellas are easy to find. Or you can make your own with bamboo skewers—like this flamingo drink topper by our own Will Brown. And, of course, it’s not an island beverage without fruit and flowers. Skewer some cherries and pineapple chunks. (Use hollowed-out pineapples to serve appetizers.) Have a bowl of edible orchids, Sweet William, or pansies at the ready. —Turn off the overhead lights. —Hang strands, ropes, or strips of LED lights on the walls, mount them under the bar, and wrap them around your plants. —Light candles in mood-setting scents, like tuberose or other tropical flowers. —If you’re outdoors, light the path with tiki torches, and put your fire pit to good use.